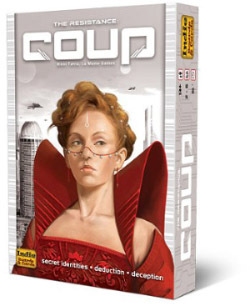 the Countessa (Blocks assassination attempts). 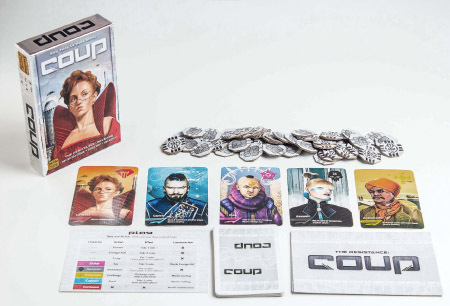 Starting with the player to the left of the dealer and going clockwise, players take turns performing one of the available actions. Income: Take one coin from the bank. This cannot be Challenged or Blocked. Foreign Aid: Take two coins from the bank. This cannot be Challenged but it can be Blocked by the Duke. 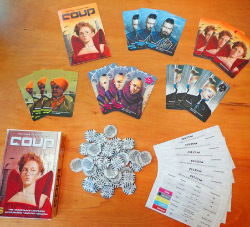 Coup: Costs seven coins. Cause a player to give up an Influence card. Cannot be Challenged or Blocked. If you start your turn with 10+ coins, you must take this action. Taxes (the Duke): Take three coins from the bank. Can be Challenged. Assassinate (the Assassin): Costs three coins. 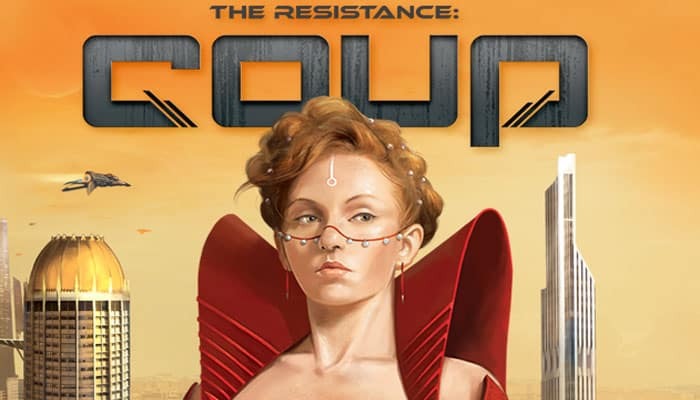 Force one player to give up an Influence card of their choice. Can be Challenged. Can be Blocked by the Contessa. Steal (the Captain): Take two coins from another player. Can be Challenged. Can be Blocked by another Captain or an Ambassador. Swap Influence (the Ambassador): Draw two Influence cards from the deck, look at them and mix them with your current Influence card(s). Place two cards back in the deck and shuffle the deck. Can be Challenged. Cannot be Blocked. If another player takes an action that can be Blocked, any other player may Block it by claiming to have the proper character on one of their Influence cards. The acting player can not perform the action and takes no other action this turn. The acting player MAY choose to Challenge the Blocking player. If they win the Challenge, the action goes through as normal. When the acting player declares their action, any other player may Challenge their right to take the action. They are saying "I don't believe you have the proper character to do that". The acting player now must prove they have the power to take the action or lose the Challenge. If they have the right character, they reveal it and place the revealed card back in the deck. They then shuffle the deck and draw a new card. The Challenging player has lost the Callenge. If the do NOT have the proper character, they lose the Challenge. Any player who loses a Challenge must turn one of their Influence cards face up for all to see. If that is their last Influence card, they are out of the game. 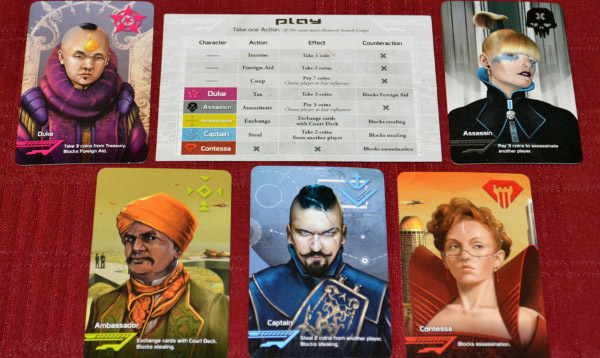 Any time a player loses an Influence card, THEY choose which of their cards to reveal.